international | Real. Deep. Stuff. While driving through the country of Guyana, it’s easy to see the differences between this country and America. For one, they drive on the opposite side of the road. Second, all traffic signs, etc. are merely suggestions. There are tons of small mom & pop shops – no Wal-Mart or Target to be found. Dogs, donkeys, horses, cows, goats and chickens meander through the city and countryside at will, sometimes even in the road, with no fear. One huge visual that stood out was the architecture of the homes and buildings. 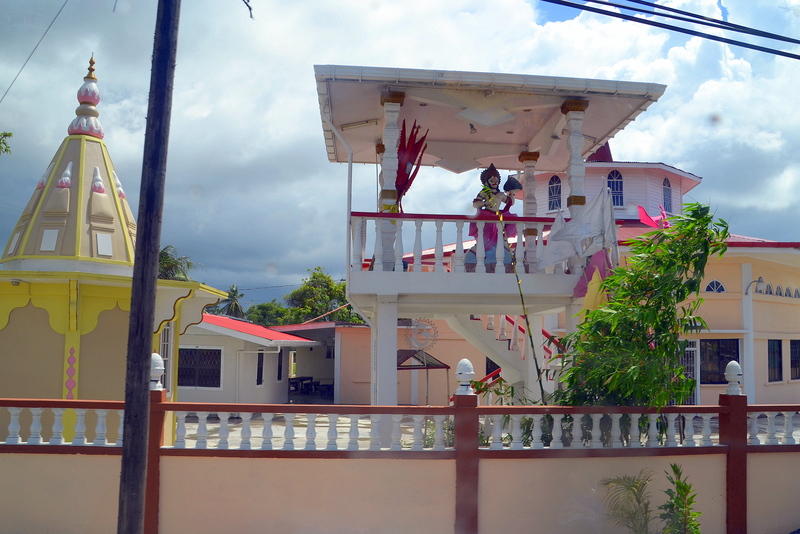 There is both a Hindu and Muslim presence in Guyana. I didn’t see much of an overtly Muslim influence, but the Hindu influence was eye-catching. After barraging our leader with a ton of questions (he was very patient with me), I learned some interesting things about Hindu homes. First, the small building in front of the home that looks like a security guard’s station is a prayer house. This is where the Hindu priest comes to pray with the family. Second are the large statues of the gods those homes worship. Some are small and easy to miss. Others are very intimidating. Several of them made my eyes grow big and catch my breath. The time and craftsmanship put into these structures is enormous and detailed. These pavilions and idols are truly works of art. One in particular, which I was unable to photograph due to poor weather, was massive. It was a huge pavilion at least two stories tall, and in it was an enormous statue of a terrifying-looking god. Completely black, with daunting white eyes and grimacing expression, it was an idol not to be missed. It stood far above the other houses and their gods. I asked our leader if the size of the statue meant something, as in trying to please that god with its grand size. Or, was it just to impress neighbors. In addition to the pavilions and statues (some homes had multiple statues in their front yards) were flags and poles. Again, I asked him what they meant and he said they also represented the gods that house worshiped. These statues were at least 6 feet tall and their pavilion dwarfed the home. At night, the spotlight illuminates the garments’ sequences and sparkling rhinestones. At first glance I thought they were real people standing there shining so brightly. I stared out the window (with camera in hand) on our many driving expeditions as we whizzed passed countless homes. At first, cold chills ran down my back when I saw these gods. They were daunting, larger than life, and not what I am used to seeing on a daily basis. Let’s talk about what’s parked in our driveways, our children, our jobs, sports, technology, vacations & entertainment, our relationships, accomplishments, achievements, what we eat, what we drink, what we wear, our work, our play, the size of our bank accounts, our social media, our hobbies, friends, family, church, our worship, what we watch, what we listen to, our volunteering, people’s approval, our fears, toys, plans, our talents and strengths, our agendas…and even ourselves. Even our faith can become an idol. And, the bigger the better! I’m not throwing stones lest I be hit by them. Trust me, I’m right there in the thick of dealing with my own stuff. Seeing these homes, without ever seeing a person who lives in them, I already know who, or what, they worship. In the U.S., we deny deny deny with a confident smile on our face. We are so blind to the fact that our schedules, properties and lives are littered with idols of every shape and size. Because there is one Almighty God, any god/idol we have in our lives has the same craftsman of the one who inspires gods/idols of all other religions in the world. Just because our idols fit conveniently into our lives, seem practical or deserved or earned, doesn’t make them any less of a god. Call a spade a spade. Call an idol and idol. For Hindu people, that’s what they do. Back home, gods are fashionable, trendy, popular and useful. They are time-savers, little (or big) indulgences, and passions gone wild…but we would never call them gods or idols because that would be wrong in the Christian faith. I came home with a whole new respect for pastors in America. How frustrating and draining it must be to stand at the pulpit week after week, month after month, year after year, trying to break through the idols – when for some the very building, pew, service hour, friends or worship songs are giant idols glaring back at the pastor from the congregation – while the people who make up the congregation sit silently and smile and insist there isn’t a problem. So, yeah, their idols were refreshing because I know where they stand and that is an excellent conversation starter. Believers need to take a serious inventory of our lives and call out the idols right in front of us. Oh that God remembers His children are made of dust and casts a broad net of grace over our lives. But make no mistake, if we do not surrender our idols/gods, He will come looking for them. He shares the throne with no one and no thing. He is a jealous God and commands we put no other god before Him. It’s a lot easier, and less painful, to surrender idols ourselves, rather than God having to root them out of our lives, prying them from our hands. But, He will because He loves us that much. Dear Almighty God, please give us eyes to see, ears to hear, a mind to understand and a heart to accept Your Truth, truth that sets us free. In Jesus’ name we pray, amen.